Soft Blanket Flash Giveaway ends @ 9pm PST! It’s another fun flash giveaway and this one is perfect for these colder months! 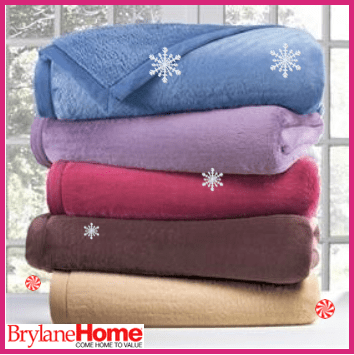 How about a soft and cozy blanket to wrap around you while you relax and have some hot chocolate or a hot toddy? We are looking for those warm moments spent together with our family during the cold months of the year, wrapped in their love and care, and the fleece of a soft indulgence blanket! Designed with two different textures, this colorful blanket would be a great addition to your cuddle time or even sleeping time. Soft and luscious, this could be a precious gift to yourself or someone on your Holiday List. You do have a list, yes? Without any doubt, this soft indulgence blanket would serve you well and warm your soul with its warm fuzziness, evoking the memories that would be elixir on your soul during long cold days and nights. One of you would walk away with one of these blankets as a prize in this super quick flash giveaway. An electric fireplace with my TV on the wall above it would make my house perfect! I’d like to add new dimmable overhead lighting. I would love to add a pellet stove in our front room! I really would love a new coffee table! I love almost everything in my house but that could use an update! New sectional couch for living room and a new couch for game room. Some new throw pillows too! We recently bought our house, and really need some decorative items (wall art in particular) to make the house our own! New recliners for the hubs and myself. I could use a new pole lamp, it’s kind of dark here! I’d love a new slipcover for my couch. I would love to have an area rug. A fireplace does a wonderful job of creating a cozy atmosphere. I would like to add some new lighting….a new floor lamp would be awesome. I’d love to get a new set of sheets for my bed. I need two lamps for my bedroom and some curtains. Candles, family photos and throw pillows! I like candles because they’re inexpensive and easy to change scents for the seasons. I would love to have some new rugs. Ours are original to the house. I could really use better lighting in the living room. And something nice to go on the end table between the two couches … besides the HUGE flower pot that’s currently growing celery. I would like some new lamps to change out some old ones. I’m weird—I think wall art is a good way to add to the home’s ambiance. I love adding seasonal candles to my home. I’d like to add some new curtains.